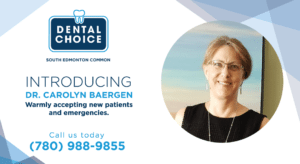 Dr. Baergen of South Edmonton Common Dental Choice is highly regarded by her patients for her friendly, personable nature, and her humming! She genuinely listens to each patient and develops treatment plans that are tailored to individual needs. Dr. Baergen enjoys walking her dog in the river valley, and reading all kinds of literature. She enjoys meeting newcomers when she coordinates ESL classes at her church. Book with her today!